MSE Is Going To Odyssey of the Mind World Finals!! Mrs. Kate Teaches Folktales and Songs to NP Kindergartners! Natalia Illuzzi and Sofie Vanmoorlegham advance to the State Tournament after winning Districts at #1 doubles on April 17. Natalia Illuzzi won Districts at the #1 singles position. She is advancing to the State Tournament on May 3rd. Congratulations, Natalia! 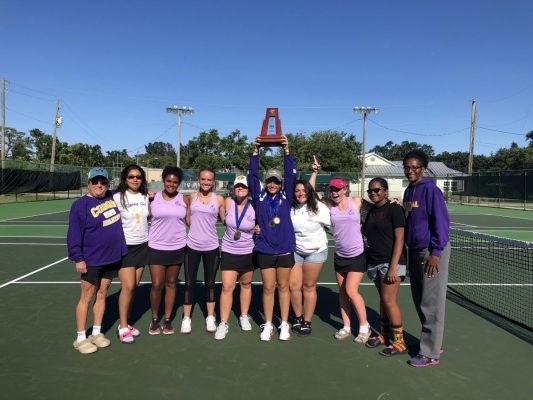 Left to Right: Coach Jeannie Glenton, Cinthia Valdez, Lanie Smith, Laura Haggerty, Sofie Vanmoorlegham, Natalia Illuzzi, Jade Sites, Isabella King, Coach Sophia Witherspoon.